The Commission on Nomenclature of Inorganic Chemistry (CNIC) met for the last time in Brisbane, Australia on 30 June to 2 July, 2001. Among those attending were three National Representatives, Profs. Risto Laitinen, Dan Meyerstein, and Lars Elding (standing in for Ebbe Norlander), Prof. Wim Koppenol (a former Commission member involved in an individual project) and two observers from the U.S. Delegation, Profs. Vince Pecararo and Bernadette Donovan-Merkert. The observers were well received and participated fully in the discussions. Revisions in the document "The Naming of New Elements," prepared for publication by W. Koppenol, were discussed and approved for forwarding to the Interdivisional Committee on Terminology, Nomenclature, and Symbols for further review. This document is now posted online for public review. Other projects being considered by the current Commission include computer generation of names (Prof. Dress), a joint organo-metallic document including metalla-cycles and possibly stereo-chemistry (Prof. Hutton), and Preferred Names document for Inorganic compounds (Dr. Damhus). Since January 2002, activities related to systematic nomenclature are being undertaken by the new IUPAC Division of Chemical Nomenclature and Structure Representation. (see also this issue News) In anticipation of that change, CNIC held a joint meeting with the ad hoc Committee on Chemical Identity and Nomenclature Systems, chaired by Alan McNaught, to discuss the future of nomenclature within IUPAC. A second joint meeting of CNIC was with the Commission on Nomenclature of Organic Chemistry (CNOC) to discuss areas of overlap between inorganic and organic compounds in a Preferred Names document presented by CNOC in draft form. There were three or four chapters with very strong overlap but not enough time available to carry out detailed discussions in Brisbane. Following that meeting a project to ensure minimum actual inconsistency in nomenclature recommendations, maximum alignment of approaches and principles, and appropriate cross-referencing between the areas covered by both the organic Preferred Names document and the inorganic Red Book I revision, was initiated. 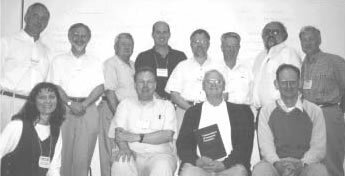 The interdisciplinary task group chaired by T. Damhus met in September 2001, with the additional participation of Neil G. Connelly and Alan McNaught. Major decisions about necessary revisions of one or the other document in order to achieve maximum alignment have been taken, and actual revisions are in progress. Only when the texts are in place, can the cross-referencing and appropriate footnotes be made to fine tune and fully align the two texts, so it is anticipated that this part of the project must take place concurrently with the review process in the Spring of 2002. Finally, CNIC heard a report from the Inorganic Division Officers. The Division has embraced the restructuring of the Union and has striven to implement the changes necessary following the decisions of the Council in Berlin of terminating the current Commissions. At that time however, the Division had two concerns with regard of the area of nomenclature. The first is to ensure that the needs of inorganic chemists are met by IUPAC nomenclature recommendations and that the current emphasis on preferred names does not result in the recommendations of names that will never see general use for inorganic compounds. The second is finding a mechanism to maintain IUPAC's considerable current expertise in inorganic nomenclature. Close interaction between the new Division of Chemical Nomenclature and Structure Representation and area experts in the Inorganic Division will be one key to sustaining essential and successful projects in this area. Many of the active past members of CNIC have been invited to serve on the Advisory Committee to the new Division. Additionally, two members of the newly formed division, Dr. J. G. Leigh (a former chair of CNIC) and myself (immediate past chair of CNIC) stand ready to receive comments and hints on issues that might be of relevance to the community concerned by inorganic nomenclature. Herbert D. Kaesz was a member of the Former CNIC from 1994 to 2001. He is currently a member of the Inorganic Chemistry Division Committee, the Division of Chemical Nomenclature and Structure Representation, and the Committee on Chemistry Education. He is a professor at the University of Caifornia at Los Angeles, California, USA.